The best New Year’s Eve celebrations in recent memory have been spent at home. The all-inclusive dinner, drinks, dancing haven’t come close to the joy of an at home meal, a bottle of bubbly – watching the ball drop in NYC and going to bed. I must be getting old! Part of the enjoyment has been a seafood feast. In years past this has included some big King Crab legs. This year I’ve not been feeling well and didn’t get to the fish monger until today. Unfortunately the monster legs can take 24 hour to thaw. So that is sadly not in consideration. Tomorrow? I have plenty of smoked salmon, but I need one more item to complete the meal. I’ve been wanting to make Insalata di Frutti di Mare for years. 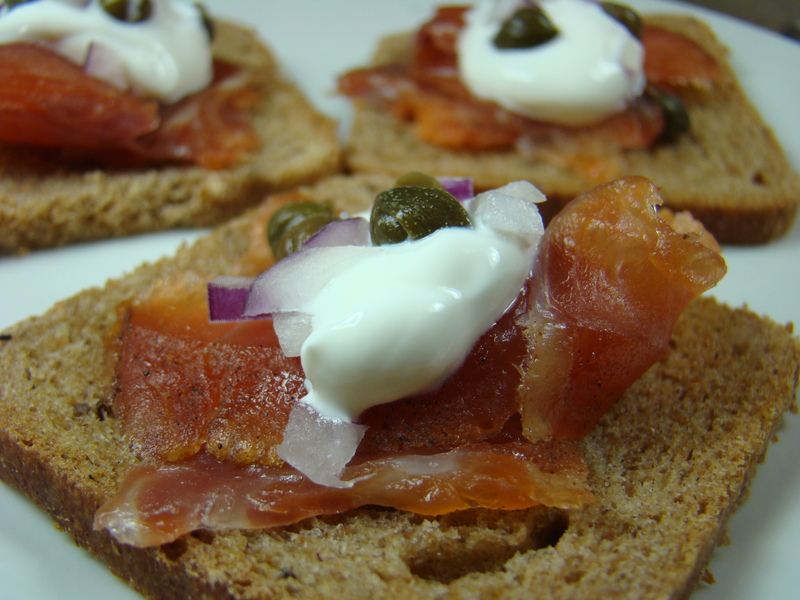 The first time I ate this was at my brother’s in-laws on Christmas Eve during a Feast of the Seven Fishes some years ago. While I looked closely at this , his mother-in-law was, let’s say – gently evasive as to the specifics. At one point I was told that it took a jar of mild giardiniera, but judging from the texture of the vegetables this was a bit of a red herring. Sure there is Shrimp and Calamari, and yes, there was celery, olives, and red peppers but the whole still eluded me while my taste buds mocked me. Good things come to the patient and persistant. Enter ChgoJohn over at his wonderful blog from the Bartonlini kitchens. He has a great post regarding his mother’s Insalata dei Calamari. A lightbulb went on. Between his post and the comment about giardiniera. I knew I was ready to tackle this. About a week ago I made the giardiniera, omitting any hot peppers. The process is simple, dice veggies, soak in salted water for 12 hours or so, rinse, and pack into jars with a good oil/vinegar mixture. It’ll keep in the fridge for a few weeks. For the seafood, I followed ChgoJohn’s Mom’s directions for the Calamari, and proceeded to quickly cook the mussels, shrimp, clam strips, plunging the quickly cooked seafood into an ice water bath after cooking. Drained and patted dry they all went into a container. 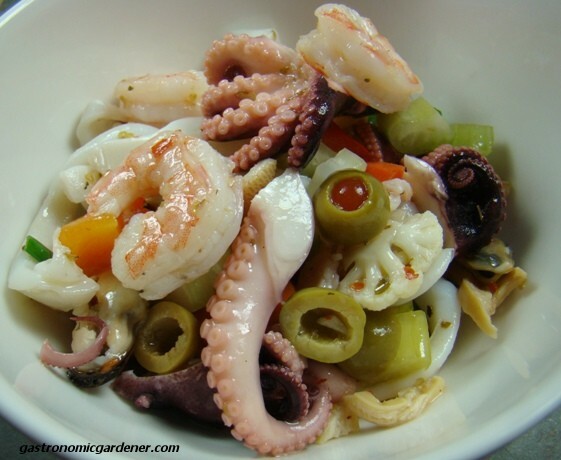 A half pound of cooked marinated baby octopus was added to the mix as was a jar of the home-made mild giardiniera, plus a bit more celery and scallion for crunch. Into the fridge to chill it went. Plated up it was delicious! Crunchy vegetables, succulent seafood, tangy dressing. I may have done it! I have two comments to make: in relation to the photography and the artistic presentation: 10/10, 100%, A+ — but in relation to content (for me only, this is) Yuk! stunning. i agree with mark 10 of 10, 100%, A+++++++ however, i’d take me some of them calamari.. and shrimp… and smoked salmon.. yum!! Happy New Year OFG! It was delicious and there’s some left over so it’ll only be better today! Happy New Year David! Looks simply amazing!! Each and every one!! Thanks Linda! It was better than I could have hoped. What a great idea, David! Using giardiniera is brilliant! 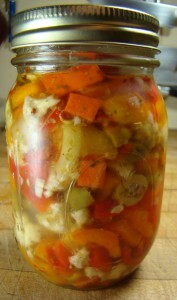 I am definitely going to make this the next time I make a batch of giardiniera. Thanks for the kindly mention and I hope yours is a Happy New Year. Thank you John, I wouldn’t have made it without your post. Happy New Year!